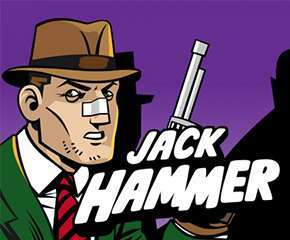 Challenge Dr.Wuten’s Evil Plans in the Jack Hammer Slot game! 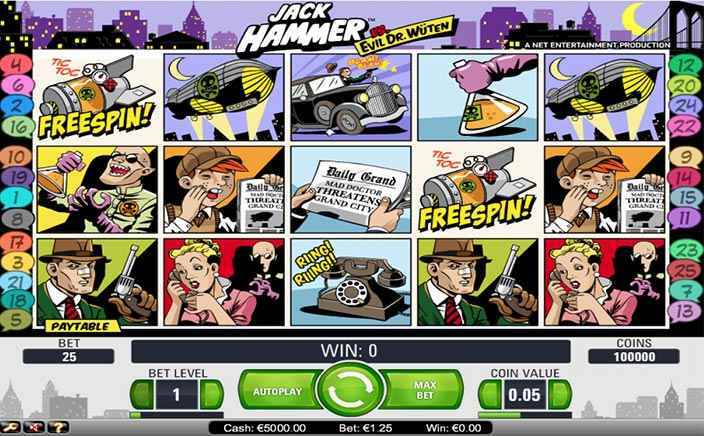 For all adventure and detective theme slot lovers, Jack Hammer is a slot game that has a gripping storyline and even more gripping paylines! The game is set against a city night sky, but there certainly is something fishy cooking in Dr.Wuten’s premises. The game consists of animated cartoon style slots that each tell a part of a story. Right from Dr.Wuten conjuring up an evil potion to release over the city at night through his hot air balloon, to exciting car chases and damsels in distress, the story of this detective themed slot game is quite interesting. The Jack Hammer slot game is a 5 reel and 25 paylines slot game. Each payline in the game can be adjusted between 1 and 10 coins. Each coin has a flexible value from £0.01 up to £1.00 and this makes the game playable from just £ 0.25 in favour of low budget fun seeking players to £ 250 in favour of high rollers looking to cash in. The Jack Hammer slot game is packed with features. The game has wilds, scatters and free spin bonuses besides a jackpot that can make your day. The game also has a very helpful sticky wins feature that can give you some really good returns. The wild symbol in the game is a conventional symbol substituting wild. Though it does not substitute for the scatter symbol or give multipliers, it can still be a crucial factor in building a winning payline. The scatter symbol in the game is the bomb, literally! The scatter symbol triggers free spins. Getting 5 scatters gives you 10 free spins, 6 scatters gives 15 free spins, 7 scatters give 20 free spins, 8 scatters give 25 free spins and 9 or more scatters gives 30 free spins. The best part about these scatter symbols is that they also trigger the sticky wins feature. The sticky wins work in such a way that whenever you get a winning payline, the symbols that constitute the winning line stick to the reels and you get additional spins until you stop getting a win line. With around 97% RTP, the Jack Hammer slot game is a game worth the stakes. When played for a max bet limit, the game can potentially yield you 250,000 coins as a jackpot which is equivalent to £10,000. To get this massive amount you will need the sleuth’s symbol 5 times in a payline. Though this might be a rare phenomenon to see, the game does offer really good returns on an overall basis. The game is fun to play and is a great slot game coming from NetEnt.